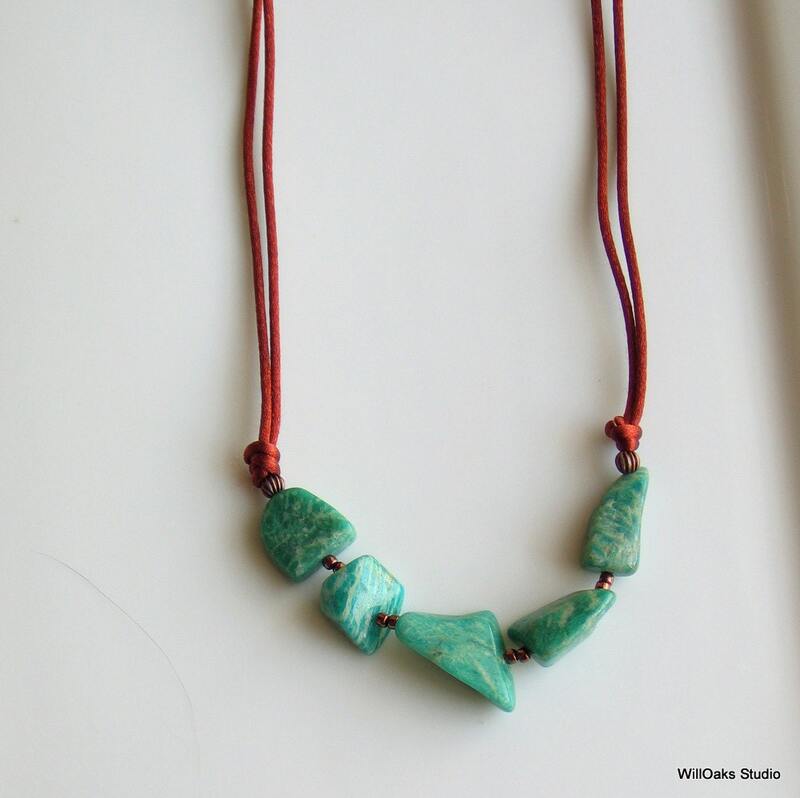 The brilliant teal in these natural Russian Amazonite polished nuggets is beautiful. Complemented with copper accents and hung from a knotted satin chain, this long stylish necklace is natural and minimalistic. 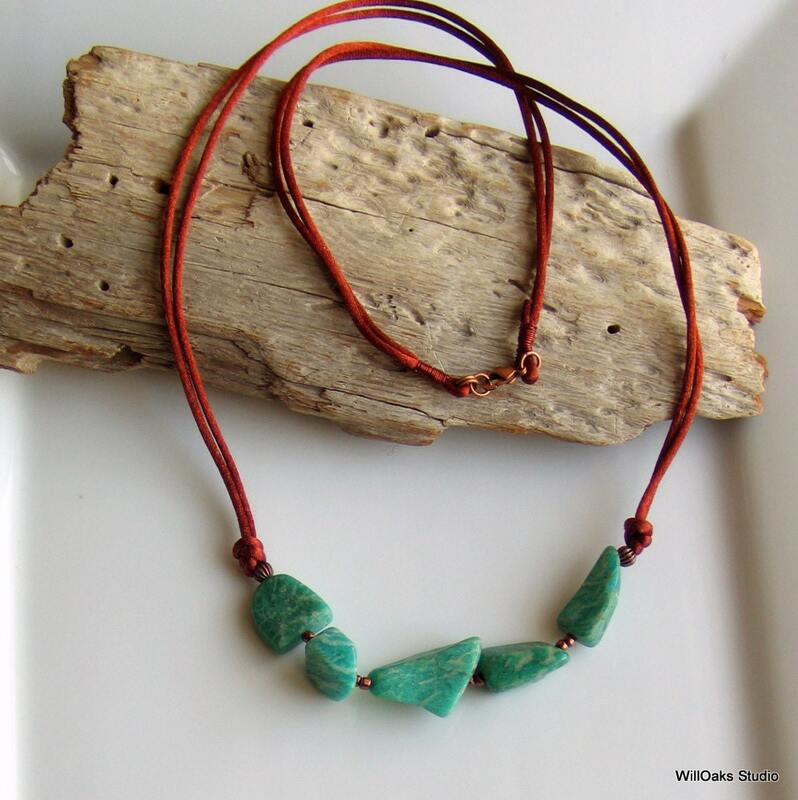 Casual chic fashion with a nod to the natural world. 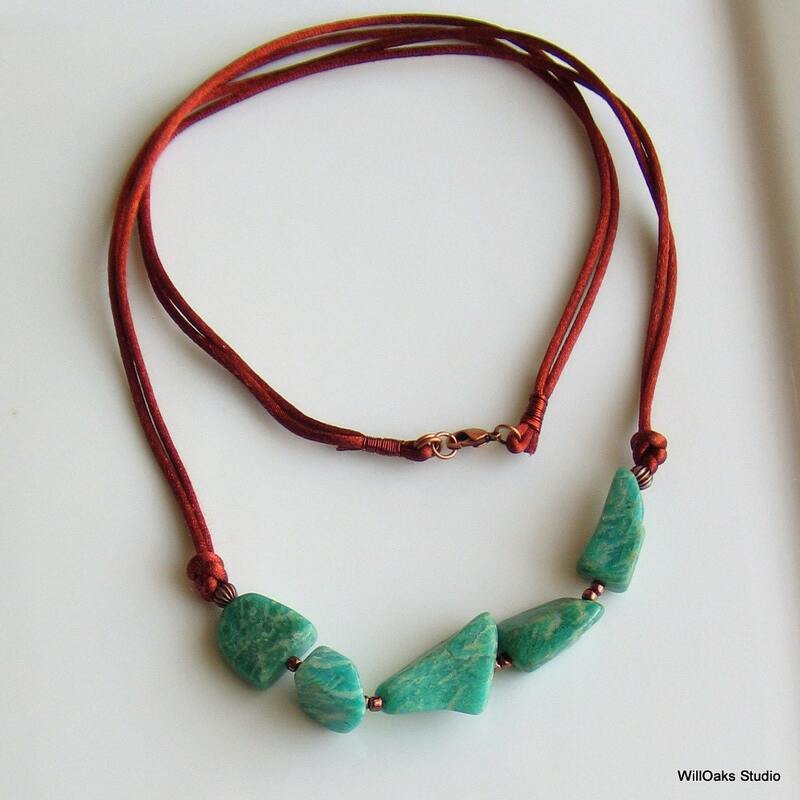 Almost 30" long, the natural stone focal is just over 4 1/2" Long and copper glass beads, copper beads, and copper plated steel lobster clasp and rings complete the design. 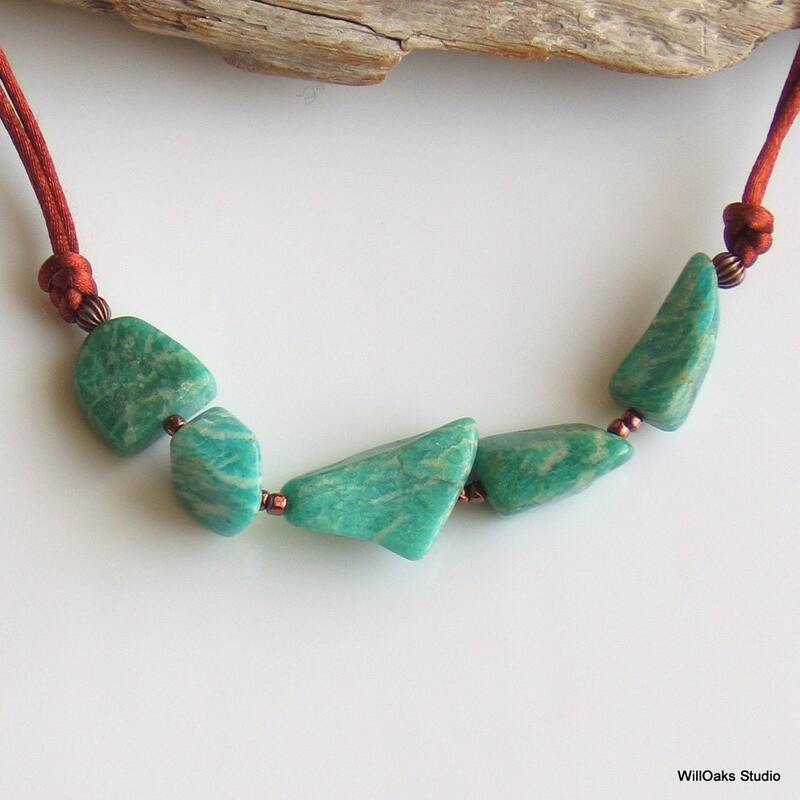 Coppery brown satin cord is hand washable and is a perfect complement to the bright teal stones. This long necklace design is my original creation and will layer nicely with other chains and necklaces. Very limited edition, there is variation in the shapes of the stone nuggets, but each collection is selected to create a balanced and interesting focal point comprised of these amazing stones. Ready to mail in a signature box or a velvet bag to gift or to keep...coordinates with both earrings and a bracelet cuff available in my shop. WillOaks Studio pieces are mailed in bubble wrap envelopes and orders are sent first class with tracking information. Find more of my Stacked Stone series here https://www.etsy.com/shop/WillOaksStudio?section_id=16437183 and enter the front of my shop here https://www.etsy.com/shop/WillOaksStudio? Thanks so much for stopping by and drop me a note with any comments or questions! 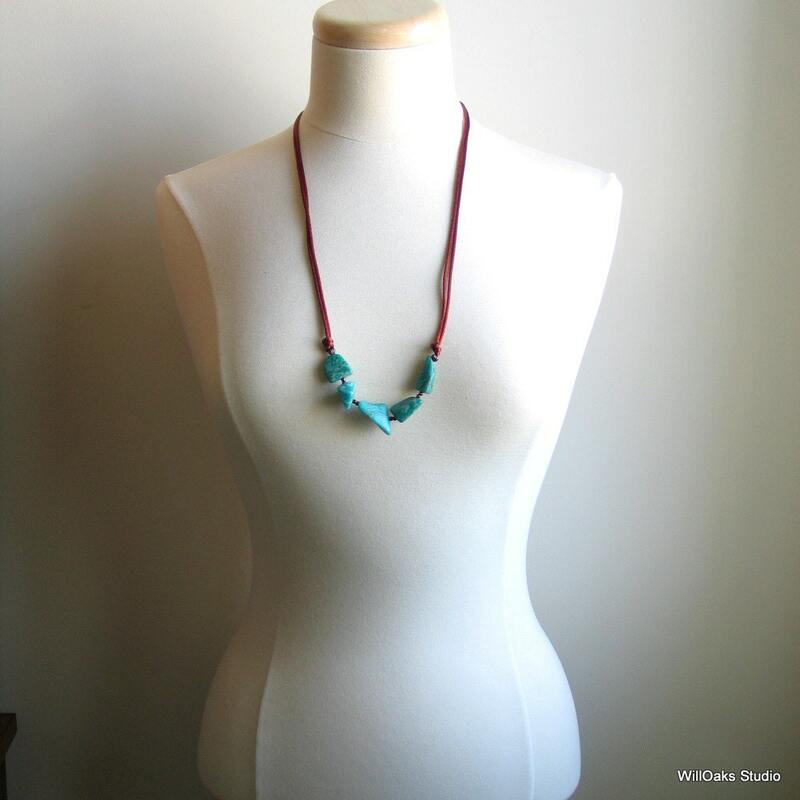 A long chunky necklace that looks as lovely as pictured! The nuggets are polished and go well with the leather!